I feel deeply sorry for the people of Arendelle, their choices of monarch aren’t exactly great. Killian hears all this and passes it on to Gold who is a little irritated by Ingrid spoiling all his plans by having a huge character change at the last minute. He now has no cover or reason for getting his family out of town – also, Anna knows he’s evil so he can’t have her hanging around. Still the stars are aligning so Gold intends to go ahead (and when Killian is no longer useful there will be a heart squishing). Flashback time! To olde timey Belle and Rumplestiltskin before they were in a relationship and when she was his servant. She complains that he never talks about all the shiny things lying around to which he responds “you’re the help”. She isn’t taking that and continues to press him. Rumple has just been on a trip to Camelot (which was apparently not great for Camelot) and brought back a magic gauntlet that seeks out a person’s greatest weakness. This will be relevant to the plot, I guess. Rumple intends to use it for manipulation because a person’s weakness is usually the thing they love most. Moving on, Belle decides that Rumple’s hoarding is a sign of a hole in his heart (that’s a terrible medical diagnosis) and he banishes her to do laundry – but she keeps on talking because she knows he can magically hear her. She sees a Dalmatian and like a small child she decides to run after it and get grabbed by a figure in a cloak. Their plan is to use the Gauntlet to stop the heroes winning all the time. Belle, of course, realises that Rumple cares for her; of course he denies it. Over to Regina and Robin – now Ingrid is dead they can restore Marian’s heart and bring her back to consciousness. She hugs Robin while he gives Regina sad-eyes and I send out addresses for divorce lawyers. Regina goes to mope at Granny’s when Marian turns up – she wants to thank Regina for helping her and point out she’s no fool. She knows she’s been away from Robin for years, she knows he’s moved on and it’s impossible to miss them pining after each other. Regina assures Marian that Robin is honourable and won’t break his wedding vows but Marian thinks that kind of lacks romance – she doesn’t want Robin to dutifully stay by her side while loving someone else and if Robin loves Marian, great, but if he loves Regina then Marian is going to step aside. Regina doesn’t get her hopes up and points out to Robin how happy his child is with his mother back; but Robin chooses Regina and adds that it’s not exactly a great situation for the kid, Roland, either way but at least this way is honest. To the town line where Gold and Belle are already preparing for their trip. Gold and Regina take a moment, Gold telling Regina he’s leaving, wanting her to pass on his goodbyes to Henry and telling her that he knew that Henry took a job with him to snoop around. She tells him why and gold admits he doesn’t know who wrote the book – and she fatalistically says that villains don’t get happy endings. She asks how Gold got his happy ending with Belle and Gold says, simply, “I took it” and suggests Regina stop moping and take her own – suggesting that Regina kill Marian. Regina rejects it – and notes that Gold is sounding a lot like Rumplestiltskin; she thought he had changed. He holds up his happy ending and notes he has repeatedly been a villain – but here he is getting his happy ending. Regina makes her goodbyes to Robin and Marian and Roland cross the line. Marian is freed from the ice curse. Robin kisses Regina goodbye (in front of Roland and Marian. AWKWARD). He crosses over the boundary and Regina rips up the book page showing her and Robin together. Downstairs, the Charmings and the Frozen group reach the portal. They open it, Elsa goes through but just before Anna joins her she asks who Gold was since she never met him and he was so helpful – and she learns he was Rumple, revealing he knew about Anna despite his lie (on the fake dagger) and showing that he was up to nefarious things all along. Which means they head up to interrupt Gold’s little ritual with the hat – he refuses to stop and starts to crush Killian’s heart but then stops. Because Belle is behind him with his real dagger, commanding him not to and to release everyone and stop his ritual – he has no choice but to obey. Belle orders him to take her to the town line, just the two of them. Alone she tells him she found the Gauntlet meaning he got it back after he traded it for her. She realises that Gold, Rumplestiltskin, would never give up power for her and that he never has and never will. She used the Gauntlet – and it led to the Dagger; meaning his greatest weakness, his true love isn’t her – it’s the dagger, it’s power. (Personally I think the whole interpreting “greatest weakness” and “true love” as synonymous is a bit of a stretch, especially if there’s a dagger that turns you into a slave out there). He tries to justify himself, but Belle refuses to make more excuses for him or to support him. Belle commands Gold to leave Storybrooke. He begs her not to – even adding that he doesn’t want to lose her, only to have her say he already has. He crosses the boundary and collapses, unable to return and stripped of magic. Henry, don’t interrupt when your mums are hitting the bottle. It’s rude. In the mansion he’s found a very obvious hidden passage (unless corridors commonly end in blank walls) behind which is a library full of blank books – that look identical to Henry’s storybook. Clearly this is the author’s house – which means they bring Emma in on their quest. Emma signs up to join. And in the present, in New York, Gold finds Ursula in an aquarium; he agrees that, yes, they were right, the villains always lose because of the rules the “Author” set – and they’re going to see him and change the rules. I’m actually going to agree with Gold and say Regina has to take her Happy Ending. Obviously, not killing Marian, but Regina – or the way she is written, rather – has taken martyrdom as her path to happiness. She keeps sacrificing, hurting and maybe, some day, the universe or some nebulous other will reward her with happiness because she’s punished herself a lot. It’s a toxic combination of fairy tale female passivity, the idea that redemption means suffering or guilty can only be alleviated by suffering and the ongoing pain of Regina. But there were ways and means here – they could have put Marian back in stasis until they could break Ingrid’s curse, or even seen if Elsa can undo the frozen heart, or whether she could get help from the trolls when they go through the portal, or the kid’s true love’s kiss – even finding someone with an ACTUAL real world memory who may not want to leave Storybrooke and is willing to guide Marian. Would all of these have worked out? Maybe not, but Regina defaulted instantly to the sacrifice option – because her happiness or, perhaps, her pursuit of happiness is regarded as selfish. Happiness is only ok if it just happens, not if it is sought; and that’s a toxic message, especially for female characters, in a lot of fairy tales. And I’m annoyed by the storyline – and not just the endless pain of Regina (though that annoys me) but because, especially in the idealised, child-aimed, fairy tale setting, this would have been a good thing to show. Roland having a mother, father and step-mother, Robin having an ex-wife and current wife, Regina and Marian finding mutual respect and all of them negotiating their life and family in an awkward situation is not only something that would be great to show, but is very much a reality of a lot of kids out there. With Once Upon a Time’s history of biological essentialism with families, this would have been a great opportunity to help counter that. Even just the message that relationships end, happily ever after doesn’t last forever, and that’s OK would have been a nice one – instead we have Robin and Marian effectively trapped in what is going to be a REALLY unhealthy relationship. Since what they did with Frozen I really hope they don’t try something similar with Maleficent or any redemption at all. I think Kristen Bauer Van Straten would be so much better at an unrepentant, snarky, irrepressibly evil villain. I am glad to see another WOC on the show – but another villain doesn’t promise a lot. And I do kind of wish that Ursula would be played by a fatter woman. Does anyone else remember how the Dark One could see the future? That seems to have disappeared. 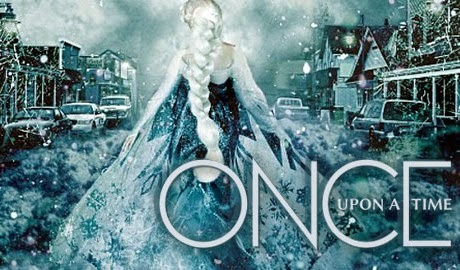 But that was an epic ending and it’s nice to see Once Upon a Time returning more to its classic routes with the main cast and less of the Frozen fanfic. I thought last week was the mid-season finale, so my musings on the first half of the season are there.